After almost a full year of rapid advances in North Korea’s nuclear arms program and escalating tensions on the Korean peninsula in 2017, Pyongyang’s attitude looked to have taken a U-turn in the New Year, when the nation’s young leader Kim Jong Un expressed willingness to start talks with South Korea. Subsequently, the first inter-Korea dialogue in more than two years was held in early January and North Korea agreed to send an official delegation to take part in the Winter Olympics, which concluded in Pyeongchang, South Korea on Sunday. Shortly before the closing ceremony of the Winter Olympics, South Korean President Moon Jae-in met with a North Korean delegation, which expressed Pyongyang’s willingness to start a dialogue with the United States, according to a statement from South Korea’s presidential Blue House. US President Donald Trump's administration responded to North Korea’s olive branch with caution, stressing that the goal of dialogue with North Korea has to be denuclearization. "We will see if Pyongyang’s message today, that it is willing to hold talks, represents the first steps along the path to denuclearization… The United States, our Olympic Host the Republic of Korea, and the international community broadly agree that denuclearization must be the result of any dialogue with North Korea. The maximum pressure campaign must continue until North Korea denuclearizes," White House Press Secretary Sarah Huckabee Sanders said in a statement. South Korean political analysts believe that North Korea is probably willing to suspend further nuclear and missile tests as possible concessions to bring the United States to the negotiation table. "When they declared the completion of becoming a so-called ‘nuclear power’, which means they have completed the intercontinental ballistic missile (ICBM) program that can attack the entire territory of the United States, it’s not really true. That’s because they have yet to overcome the technical difficulties that allow missiles to reenter the atmosphere and guide them to their targets. They hurriedly declared the completion of becoming a ‘nuclear power,’ why? That’s because they’re saying, as long as you do not touch our existing nuclear weapons capabilities, we’re willing to talk. We can even declare a moratorium on further testing of nuclear weapons and missiles. After all, we’re a nation with completed nuclear capabilities, why do we need to test them anymore?" Kim Jae-chun, an international relations professor at Sogang University in Seoul and a former South Korean government adviser, told Sputnik. 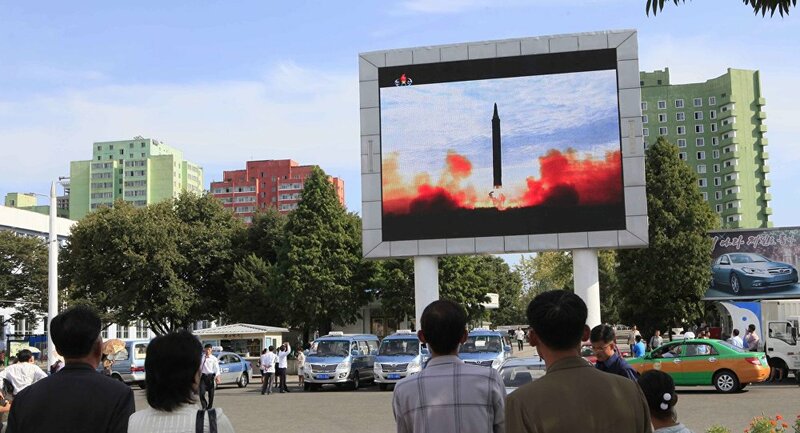 In December 2017, after successfully testing the Hwasong-15 type missile system which Pyongyang claims to be capable of reaching any part of the mainland of the United States, the North Korean government said that the tested ICBM meets the goal of the completion of the missile weaponry system development set by the Democratic People’s Republic of Korea. The South Korea-based expert suggested that even after Pyongyang agrees to suspend further nuclear and missile tests, it is unlikely for North Korea to consider "freezing" its nuclear arms program, which would require verification and inspection by international experts. "There’s a big difference between ‘freezing’ and suspension. Suspension of [nuclear and missile] testing is not that of a difficult condition for North Korea. But ‘freezing’ nuclear activities and missile activities is completely something else. You can suspend testing, but you can continue to work on activities that can enhance your nuclear and missiles capabilities. If you ‘freeze’ all these activities, you should be able to send those International Atomic Energy Agency (IAEA) inspectors to North Korea and allow them to inspect the nuclear facilities and sites. I don’t think North Korea would accept the request of ‘freezing’ all of their nuclear and missile activities," Kim said. South Korea needs to be more cautious and monitor the result of negotiations between North Korea and the United States closely, Professor Kim warned. "My worry is that those so-called negotiations between the United States and North Korea might actually work to the disadvantage of South Korea, because Trump might eventually be OK with North Korea retaining some of its nuclear weapons, as long as they give up ICBMs. Those [remaining] nuclear weapons are really troublesome to South Koreans. That is the kind of deal president Moon should be more worried about," he said. The expert pointed out that the United States is more worried about North Korea’s ICBMs than its nuclear arsenal. "What really matters to the United States are the ICBMs. Without the ICBMs, North Korea’s nuclear weapons do not pose a direct threat to the United States, although they do pose serious threats to South Korea and Japan," he said. Cheon Seong-whun, a visiting research fellow at the Asan Institute for Policy Studies in Seoul, who served as a presidential secretary for security strategy in South Korea until early this year, expressed similar concerns over South Korea’s role in negotiations between North Korea and the United States. "Actually, we had a very bitter experience in the 1990s when North Korea and the United States got together in a direct bilateral dialogue in Geneva. South Korea was not part of that dialogue. President Kim Young-sam and his administration experienced very difficult periods. If there’s any talk between North Korea and the United States, South Korea should be on the table, because we’re the No. 1 country gets the most threat from North Korea’s nuclear capabilities. I can’t imagine any serious talks between Washington and Pyongyang, without Seoul," Cheon told Sputnik. The former South Korean official believes North Korea is not ready to conclude its "charm offensive" following the end of the Winter Olympics. "Kim Jong Un is beginning to feel the pain from the growing pressure from the international community, especially since last July. They’re running out of hard currencies and their major export routes are being blocked. Kim Jong Un’s strategy now is to cool down the heat and use the Pyeongchang Winter Olympics games as his ‘charm offensive’ to the international community. Until he feels he has implemented this ‘charm offensive’ strategy, he will refrain from further provocation with another nuclear or missile test," Cheon said. However, the expert pointed out that the South Korean public has become "immune" to such peace gestures from North Korea. "There is a heated debate ongoing in South Korea. Some conservatives even went into the streets to block the North Korean special envoy from entering South Korea territory. I think Kim Jong Un is embarrassed that the South Korea public’s response to his ‘charm offensive’, unlike 10-20 years ago, has been very cool. The younger generations [in South Korea] have shown their very critical view of North Korea, even with some opinion leaders expressing that North Korea athletes and cheerleaders seem to come from a completely different world," he said. The expert suggested North Korea’s response to joint military exercises between South Korea and the United States, scheduled to resume in early April after being suspended during the Winter Olympics, will be a good indicator of Kim Jong Un’s patience with the current "charm offensive" strategy. The views and opinions expressed in this article are those of the contrubutors and do not necessarily reflect those of Sputnik.